I suppose the narrative is less ‘I don’t like double IPAs’ and more ‘I don’t like not-very-good double IPAs’ – and too many breweries seem to think it’s a style at which they will be especially successful. Whether it is down to dark powers or sheer hard work, Jean Broillet IV and the team at Tired Hands are consistently good at absolutely everything. It was hard to choose just a few favorites from their ever-changing lineup; among their 2013 beers I’ve particularly enjoyed are their Caskette and LiverPool, both milds, We Are 138, a Cascadian Dark Ale, and Dr. Grasshopper, a Berliner Weisse. And although I maintain that double IPAs rarely meet expectations, this one exceeded everything. Sure, Russian River’s Pliny the Elder and Pliny the Younger are good, but they aren’t this good. Really. Yes, it’s another from Tired Hands – and yes, I realize I am extremely fortunate to be able to walk there whenever the mood takes me. In some ways, this is a ‘typical’ Tired Hands beer – a saison with something a little bit different. In this instance, the Szechuan peppercorns were what made this one stand out, adding a nice kick and the odd bit of a good sort of numbness. We won an AHA medal for homebrewing a mead with Szechuan peppercorns some years back, but we didn’t approach this level of expertise. It’s all good. As mentioned above, a general rule, I don’t love most ‘imperial’ beers – so many brewers seem to be caught up in an ABV arms race, so it’s nice to dial it back to a real historical example. Wells & Young’s events during Philly Beer Week have become must-attend annual outings for me – there’s always someone personable from the brewery, and you get a nice history lesson with your beer. I enjoyed getting to compare both the cask and bottled versions of this beer, though I’d give the edge to the bottled one, which likely had a little more time to mellow. But it’s a small quibble – both were very tasty indeed. As much as I enjoyed everything I had at Mikkeller & Friends in Copenhagen – especially for the opportunity to try Mikkeller’s less high-octane beers, I have to admit a slight edge to a few beers from brewer Mikkel Borg Bjergsø’s former students who went on to found To Øl. Brewers Tobias Emil Jensen and Tore Gynther describe this beer as a ‘morning after’ affair, but I found it just as pleasant as a curtain-raiser to the evening. It was also a fine illustration that just because you can make excellent ‘unusual’ beers, you can show off your skills with a very straightforward recipe as well. Another entry from To Øl – I am always happy to find a hoppy porter. One of my local seasonal favorites is Tröegs Dead Reckoning Porter, and this was almost like an amped-up version, though it never went overboard; it was really rather delightful. In fairness, we had excellent (if pricey) beer all over Denmark – more large-scale breweries could take a leaf from Carlsberg’s page and invest in their own in-house (apologies for the loaded term coming up) ‘craft’ lines, as everything we tried from their Jacobsen line was excellent, as was their brewery tour. Big doesn’t have to mean bad, just as small isn’t necessarily good, but they seem to be doing both right there. But fear not – Mikkeller did make the list. 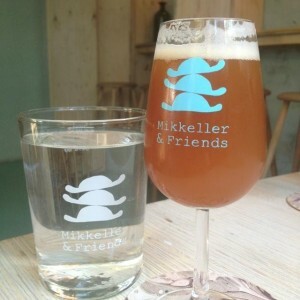 The frankly amazing taplist at Mikkeller & Friends included a very wide range of beers, both Mikkel-brewed and literally those brewed by his friends, and I loved the variety on display. We tend to get the higher-ABV end of the Mikkeller spectrum in the US, and it was wonderful to see how much more there was on offer. I love a good English Pale Ale, and this fit the bill perfectly. Yes, Mikkeller can make wonderfully weird beers, but that’s only one part of the story. I do love a good altbier, and I especially appreciate what Peter Esser and Sebastian Sauer are doing with Freigeist Bierkultur, the small experimental line from already-tiny Braustelle Brewery in Cologne. Their goal of reviving old and often peculiar (to modern tastes) German beers is one I wholeheartedly endorse. It can be difficult to avoid something of a hipster label when enjoying these occasionally difficult-to-find and sometimes strange beers, but they are well worth the effort to seek out. Yes, it’s another double entry. In this case, ‘Sauer’ refers to brewer Sebastian Sauer of Freigeist Bierkultur, as well as for the beer’s lactic sourness. This beer has a lot going on – it’s dark and chewy, but also salty – like a gose, a style I am quite happy is having a renaissance, but also refreshingly sour, so it’s something akin to a heavier, dark Berliner Weisse. This is all wrapped up in a ‘porter,’ though those who adhere strictly to (modern) style conventions might wish they had a different category in which to place this beer. Despite the current popularity of the very broad range of sour beers on the market, I often avoid this trend as they are rarely to my taste – and this is not to take a contrarian position, but simply because I don’t like more than a tiny smidgen of Brettanomyces (you can blame me for not being a wine drinker). However, I do like the lactic end of the sour spectrum, and this sits perfectly in that spot. After quite a saga, the General Lafayette Inn regenerated into the Barren Hill Tavern and Brewery, with Scott Morrison’s beers taking pride of place. Everything has been outstanding so far – the West Coast Oats and Burton IPA are particular stand-outs thus far – but I had to give the nod to the Edel Helles. Being able to drink the beer just feet from where it was brewed is especially useful for a beer in this style; sometimes even the best ones from Germany don’t necessarily travel well. This one is perfect. I have been a big fan of Batemans for many years, dating back to when I lived in the UK; indeed, I’ve often fantasized about being able to move to Lincolnshire, where I could easily enjoy their freshest local beers. Should I get transferred, I’d most likely end up near London again, but I would make it a priority to finally investigate their brewery tour at some point. Though rarely ‘weird’ or flashy, they always have a solid lineup, and I hope that more of their beers make their way to the US in future. I love this because it’s chewy and seems full-bodied, but without the 7%+ wallop it might have had it been brewed in the US. Lovely. So, there you have 2013 – happy new year! Book Review: D.G. Yuengling & Son, Inc.